What can printed brochures do for me? Brochures are an important promotional tool for any business, they are a great way to communicate with your target audience. Professionally-produced brochures with a high-quality look and feel can make for a great first impression of your business - so when you look at the brochure printers available to do the job, it's vital you select our quality brochure printing service that can give you a perfect product at a low price. After all, not everyone has access to the internet and with brochures, you can directly reach your customers rather than hope that they come to you first. Our quality brochures are ideal for catalogues, newsletters, programmes, rag magazines and advertising material. 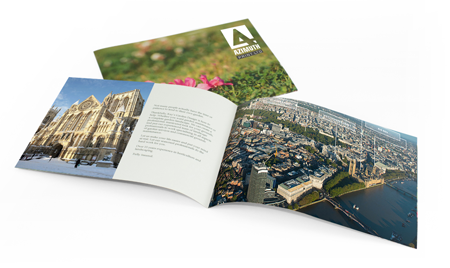 Azimuth Print, the UK's premier brochure printer offers a high-quality fast brochure printing service. We can print brochures in A6 (148mm x 105mm), A5 (210mm x 148mm) and A4 (297mm x 210mm) sizes in portrait or landscape (excluding A4), with the number of pages you can have in each one varying from 8 to 40+. The brochure’s page count includes 4 pages for the outside and inside of the front and back covers, so an 8 page brochure would have the covers with 4 pages and an inside sheet with an additional 4 pages to give a total of 8 pages. We can produce brochures with three types of covers; Soft(Self Cover), Heavy(Board Cover) or Laminated Board Cover Brochures. Other quantities of brochures and paper weights also available on request. You can either send us your own artwork or commission our designers to come up with a great look for your printed brochures for an extra charge. If you need to make small changes to your copy and design, we can take care of these at no extra cost, while larger amendments to your brochure can also be made for a fee. To find out more about the UK's premier brochure printer, just get in touch for a quote or for answers to any questions you might have about our brochure printing services.